Memory and permanence in SAARA138's photographic textiles. With the advent of digital technology, film photography began to slip into obsolescence. But now, the focus has changed. All the cool kids are shooting film again. Who hasn’t been to a music festival where the disposable camera is an accessory as necessary as glitter? We have all witnessed the rise of Facebook albums simply titled ‘35mm’. We now take two photos: one on our iPhones and the other with our polaroids. Today, we insist on existing in two photographic realms. Contemporary artist and current Honours student at the Sydney College of the Arts SAARA138 examines this space between the analogue and the digital. Working with photography and textile, in their work After Image (2017), film photography is digitised, then printed and rendered onto fabric and then hand-embroidered. This lengthy, arduous process brings the image in and out of tactility, resulting in a work that provokes questions about the photographic medium itself. Photography has often been perceived as a static form, simply arresting movement in a singular moment. However, SAARA138 draws attention to the surface of the photograph by embroidering it, making the photograph a physical, living object. 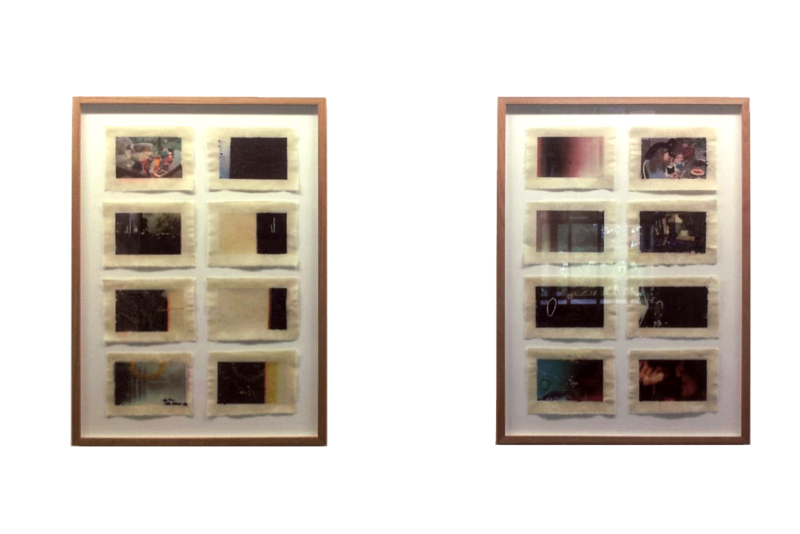 In fact, the photographs that are embroidered have been chosen because they contain some ‘error’ such as bleeding light, double-ups or over-exposure. While in the digital realm, these photos would immediately go to the bin (alongside my 300 rejected selfies), analogue photography is fragile, unstable and mercurial. Indeed, they are far from static. So why does analogue, with all its unpredictability, continue to seduce and entice us? Why does everyone suddenly own one of those K-Mart purchased polaroids? It seems that the trend runs deeper than mere novelty, to a more profound psychological tendency. After all, photographs are often associated with the nostalgia of family albums. SAARA138 recognises this same sentimentality when we think of textile objects associated with the halcyon days of our childhood. Whether it be the teddy bear, the hot wheels, the barbie or the tamagotchi, a single object remains indelibly imprinted in our memory. It is for this exact reason, we all wept at the end of Toy Story 3: it was a signifier of the loss of childhood in an increasingly virtual world. SAARA138 combines the photographic and textile medium to show the vital role that these objects play in human experience and constructing personal subjective histories. They are catalysts for questions around memory, identity and permanence. SAARA138 rightfully identifies a parallel between technological and human redundancy. We take photographs to capture a particular moment in time because we know that our memories will inevitably deteriorate. We take film photographs, specifically, so that we may create an object that will last beyond our own corporeal limits. However, these too will eventually decay and entropy. After Image is not a fixation on morbidity though, but an invitation for contemplation. The delicate embroidery forces us to look at the images in depth. These moments of contemplation seem scarce as SAARA138 points out “in an image-saturated world… everyone is a photographer.” The quick click of the shutter is visually juxtaposed with the labour of needle and thread. We can imagine the time and energy used in the human gesture. For many, embroidery is associated with simply ‘hobby’ and ‘craft’ existing in a separate domain from ‘high’ art. Indeed, textile art has been alienated from ‘high’ art due to years of historical bias based on gender. Historically seen as ‘women’s’ work, embroidery and textile was never exhibited in the white walls of the gallery alongside paintings, sculptures, and photography which were mediums seen as conventionally ‘masculine’. Contemporary art has challenged this art historical hierarchy, and SAARA138 amalgamates the two mediums that have been separated for so long. Whilst the operative term in the title of the work, After, references SAARA138’s artistic process of manipulating image, it also raises a number of existential questions. What happens post-analogue, post-digital, post-human? Do objects (and by extension people) evolve just as the photographs in the work? Or do they (and we) dissolve into oblivion? Concerned with these issues of temporality, After Image lends new meaning to the adage, ‘a stitch in time’, purely with a spool of thread and a spool of film. SAARA138 is completing their Honours year of a Bachelor of Fine Arts (Honours) at the Sydney College of the Arts. They have exhibited their work at the Sydney College of the Arts Undergraduate Degree Show in 2017 and was part of the ‘Tonic’ Group Exhibition at Gaffa Gallery curated by Kimberly Peel in February 2018.